Join us and help us raise money to use for future advertising, marketing, and memorabilia. Thanks! Between June 24, 2016 and March 7, 2017 you may have completed a document named the Northern California Raiders Fans Against Relocation. These findings were sent to the other 31 National Football League franchises prior to the March 26, 2017 relocation vote, which approved the Raiders move to Las Vegas. This past week the City of Oakland filed in Federal Court an antitrust lawsuit for damages against the Raiders and each of the other 31 NFL Franchises. Following the release, Stay In Oakland was approached by parties involved requesting their support in a public action forthcoming. If you support the City of Oakland lawsuit and would like to help send a message to the National Football League, your may contribute at the Stay In Oakland Donate Link below. If you have any questions regarding this matter please do not hesitate to call or email. Volunteers are needed for said upcoming public action. Please request more information using the contact information listed. Christmas may be coming a day early. 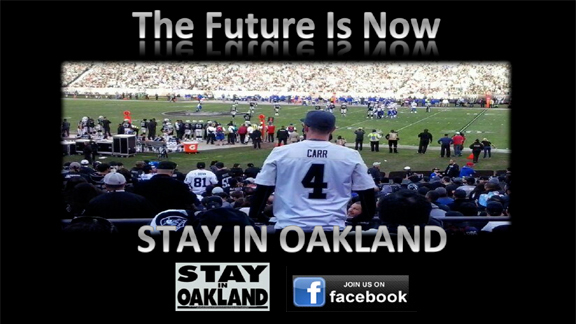 Corporate Support: Stay In Oakland is looking for local business and coporate support to broaden this movement. This transcends sports for the City of Oakland, Alameda County, and surrounding areas. It is community that provides current jobs and the opportunity to shape an urban area into social and financial stability. It is community. It is culture. The opportunity is now. 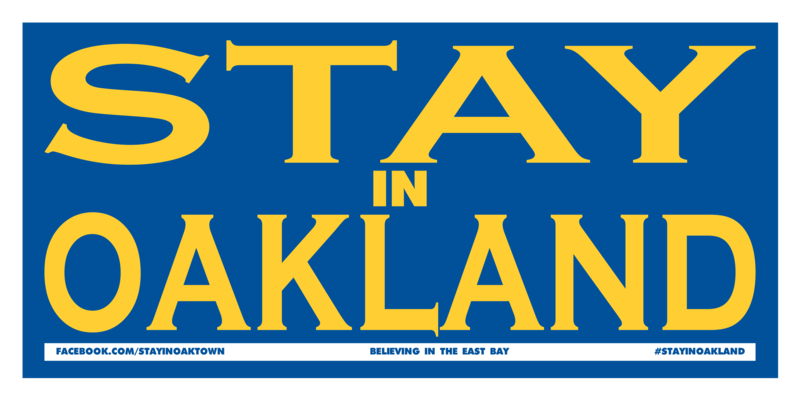 Stay In Oakland is a fan based community movement supporting the efforts to keep professional sports in the City of Oakland while improving the local economy as a whole. Join us in bringing awareness to the City of Oakland, Alameda County, and the surrounding areas. On October 17, 2016, the Mayor of Las Vegas signed a bill for $750 million of public financing to bring the Raiders to Sin City. Oakland Raiders Owner Mark Davis has fully committed to Las Vegas and refuses to further negotiate with the City of Oakland and County of Alameda, prohibiting support for a solution in the Raiders current home market. On March 27, 2017 the Raiders were conditioally approved for relocation to Las Vegas. 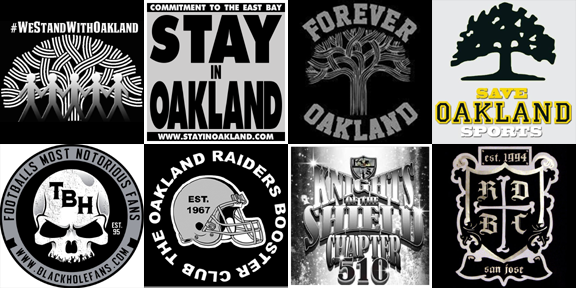 Stay In Oakland will continue to spread the message and garner public support in hope the NFL will realize the Oakland market is the best solution for financial viability and stability. 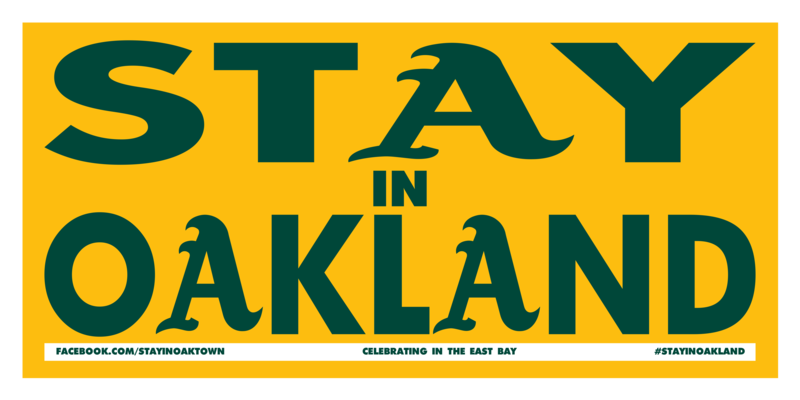 Stay In Oakland has distributed over 35,000 placards at the Coliseum. The 11"x17" cards made their debut on Thursday, November 20, 2014 to a national TV audience. In addition to the national exposure, several local media outlets both in print and television documented the efforts. Four weeks later twelve 3’x6’ banners, donated by local businesses, were displayed at the December 21, 2014 game. Since then the movement has distributed over 4200 promotional stickers at the Coliseum, Arena, and local Oakland businesses. 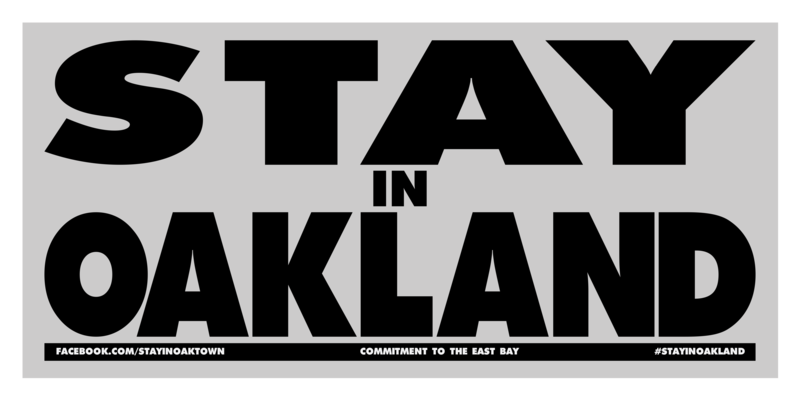 Stay In Oakland T-shirts have been sold at public meetings to raise funding for additional efforts. Window decals, coffee cups, various T-shirts, sweatshirts, hoodies, signs and flags are are sold online, in front of the Coliseum on gameday, and a retail presence is expected in the future. More information on our efforts will be posted, as it becomes available. Three simple words: STAY IN OAKLAND! If you like our efforts and want to see this movement grow please donate what you feel comfortable with. Every dontation will be greatly appreciated. 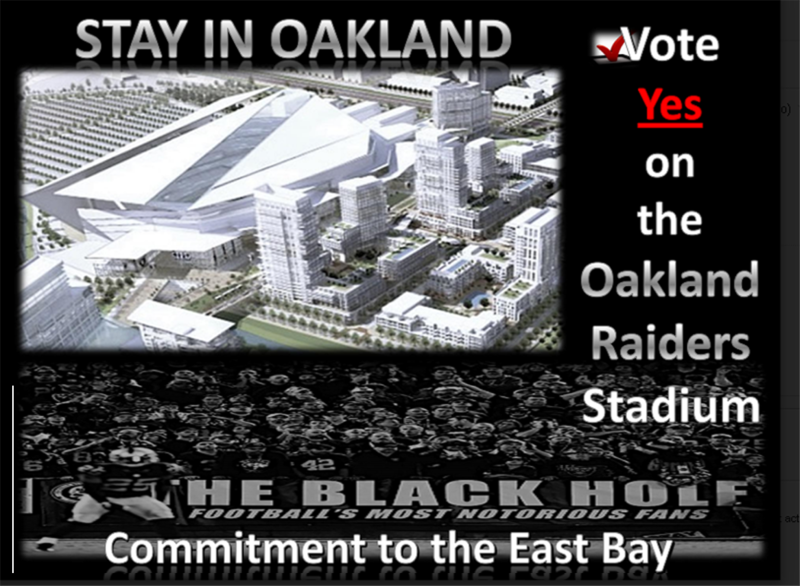 Every $5.00 donation will bring 50 Stay In Oakland paper placards to the Oakland-Alameda County Coliseum on gameday. Click on the button below.